Having wrapped up the league and promotion a week earlier, the final day trip to Oadby would always have a element of after the Lord Mayor’s Show. With Oadby fourth in the table and unable to make the play-off places, there was little to play for but pride. The hosts seemed keen to make amends for the home loss in the county cup semi-final as they fielded their strongest team, while weakened Melton were again without several regulars. Oadby were quickest out of the blocks and caught Melton napping in the early phases. The visitors missed several first-up tackles and the hosts took advantage with some flowing play. An early penalty saw a well-worked rolling maul give Oadby their first points with a try. Soon after, a wayward kick fell straight to the dangerous winger who simply sped up the line, leaving despairing tacklers behind. Mark Matthews hauled him down just short of the line, but good support saw the home full-back score. A stunned Melton tried everything, but suffered the ignominy of a soft interception try and conversion as Oadby opened a 17-0 lead within 10 minutes. Realising it would be no easy task to claw their way back, Melton finally woke up and started to play some decent rugby. The forwards upped their game, and after a lengthy phase of play, a big drive for the line saw Marcus Badham crash over and Matt Cox convert. Taking heart, Melton continued to press with Dave Osborne and Christian Jeremiah prominent in the loose. An attacking lineout gave Chris Rose quick ball and Carl Prior took it at pace to burst through some wayward tackling and score a fine try. Cox’s second conversion narrowed the deficit to 17-14. If it had stayed that way into the break, Melton would have been reasonably satisfied with their comeback, but on the stroke of half-time Oadby ran a penalty move with a clever switch to the winger who scored under the posts. The easy conversion restored Oadby’s comfortable lead at 24-14. Head coach Gareth Collins gave the team a strong talking-to and the visitors began the second half with real purpose. Leon Gormley and James Woolley led the way with powerful running, causing the hosts plenty of problems and forcing them to concede a string of penalties. Melton’s sheer determination finally paid off when Sam Badham took the ball into contact and was driven over for a workmanlike try to reduce the gap to 24-19. Sensible rugby was needed to maintain the pressure on Oadby as a hailstorm replaced the spring sunshine. The weather made the ball slippery, but that was no excuse for the next try from a set scrum near Melton’s line. It squirted out the back of the scrum at a rate of knots and the alert Oadby scrum-half dived on it over the line for a fortunate converted try. Melton tried everything to hit back, but the hosts had worked out a way to stifle their opponents’ driving play. The wrong options were taken too often by the champions as they tried with increasing desperation to break through in the face of determined defence. 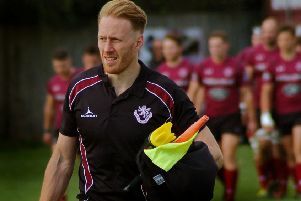 Melton camped near the Oadby line for the final 10 minutes, but there was simply no way through a fired-up team who sealed a hard-fought and deserved win. Melton will need everyone fit for the County Cup Final on Tuesday, May 3 as they try to cap an excellent season.